XIMEA is following the developments in the USB Implementers Forum very closely and now especially due to the substantial advances in the field of USB 3.1 technology. Considerable time has passed since the finalization of USB 3.1 specification in August 2013 where an announcement was made that it would double USB 3.0 theoretical transfer speeds to 10 Gbps and support scalable power delivery of up to 100 Watt using the USB Power Delivery spec. XIMEA, at the moment, does not provide USB 3.1 Gen 2 industrial cameras, but we will update our partners through website, newsletter, direct email or personally as soon as the situation will change. USB4 - USB-IF has taken the royalty-free specification provided by Intel and is working on next version. 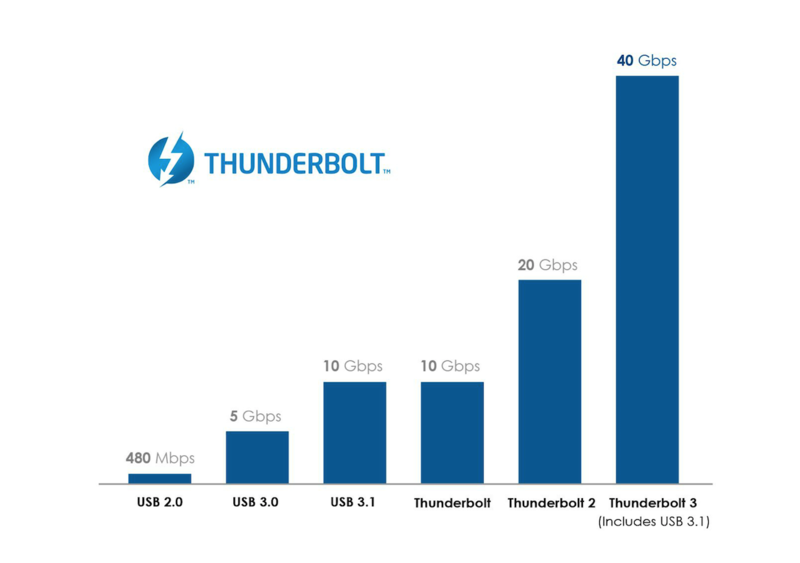 This would mean Thunderbolt 3 which would bring the bandwidth of USB to 40Gb/s. USB 3.2. again, doubles the speeds of the previous generation, bringing the maximum theoretical limit of 20Gbps (2.5GB/sec) and keeping the now more familiar Type-C socket. USB 3.0, which became USB 3.1 Gen 1 is now USB 3.2 Gen 1. USB 3.1 Gen 2 now becomes USB 3.2 Gen 2.
new USB 3.2 hosts and devices can now be designed as multi-lane solutions, allowing for up to two lanes of 5 Gbps or two lanes of 10 Gbps operation. USB 3.1 Gen 2 will add an optional 10 Gbit/s transfer rate. Gen 2 throughput is approximately 2.5 times higher than USB 3.0 due to more effective new data encoding scheme - actual rate of 1 Gigabyte per second. For now, USB 3.1 Gen 2 cables have the maximum length of 1 meter. USB-IF certified USB 3.1 Gen 2 devices will use a new SuperSpeed USB 10 Gbps logo which you can see below. USB 3.1 1.0 specification was published July 2013. Introduction of new connectors with enhanced EMI contact zones that are designed to minimize RF leakage. Radiated interference from the USB interface and susceptibility to other RF sources are improved. Backwards compatible with previous ones. USB 3.1 capable products will begin to ship in the first half of 2015, partly due to the backing of companies as Microsoft, Intel and Apple. Officials in the European Union and China have approved the verification procedures for USB 3.1 which should help the technology come to market sooner than expected. At Computex 2015 Intel showcased that company has abandoned its proprietary connector replacing it with the super-fast Thunderbolt standard and adopted USB Type-C connectors to supercharge the reversible cable. Thunderbolt 3 will be backwards compatible with USB 3.1 Type-C ports by integrating USB 3.1 controller into the cable making it able to be used on any USB Type-C port. Optical Fibre cable 40 Gbps for lengths up to 60 meters (planned for 2016). USB Type-C ports are able to support many different protocols using system aptly called “alternate modes”. This interesting feature means that you can have adapters that can output HDMI, VGA, DisplayPort or other connections from a single USB port (last Apple MacBook provides this with USB Type-C Digital Multiport Adaptor), which represents fewer types of ports on the host device in the future - further miniaturization. "SuperSpeed USB 10 Gbps uses a more efficient data encoding and will deliver more than twice the effective data through-put performance of existing SuperSpeed USB over enhanced, fully backward compatible USB connectors and cables. Compatibility is assured with existing USB 3.0 software stacks and device class protocols as well as with existing 5Gbps hubs and devices and USB 2.0 products." As you can see in the logo, the new upgrade is referred to as "SuperSpeed+" and while a lot of work has already been done, there is still some time before this will transfer into products. USB Promoter Group already organized and will be holding continuous developer conferences to further promote the standard. XIMEA team was already present on several conferences and plans to keep this practice to follow the newest progress and ensure that our partners and customers receive the most up to date information and exceptional products based on the most modern technology that is available at the moment. In addition to previous USB Promoter Group announcements, there is a separate category which notified that design of the USB Type-C plug is finalized. This new type of USB plug deserves special attention since it is supposed to completely replace every USB connector type of any size that is currently available. Many people compare it to Apple's Lightning cables because the new connector is also reversible and can be used inserted in any orientation. After USB Type-C finalization, which IT world quickly adopted, it is possible to see already available devices, cables, adapters and other accessories that support the new reversible connector. Few examples are: latest Apple MacBook has one, latest Chromebook Pixel with two USB Type-C ports, HP Pavilion x2, Nokia’s N1 tablet etc. Summarizing the USB-IF's press release, the new connector is "similar in size" to current micro USB 2.0 Type-B connectors (the ones you use for most non-Apple phones and tablets). It is designed to be "robust enough for laptops and tablets" and "slim enough for mobile phones." The openings for the connector measure 8.4mm by 2.6mm. USB Type-C connector has 18 pins and is basically a unification of two USB 3.1 SuperSpeed connectors (these have four pins and additional five to enable 10Gbps). Simply put - if you plug the connector one way one set of pins is used and if you reverse it the other set is used. An important side-note is that cables and adapters connecting older Type-A and Type-B ports to Type-C devices will be readily available. For further comfort, there will also be new USB cables that have a USB Type-C connector at both ends. A huge benefit, which is often neglected, is that USB Type-C connector allows delivery of up to 100 watts through the USB cable - that is enough to charge 4K monitor, most peripherals and in fact laptop itself. 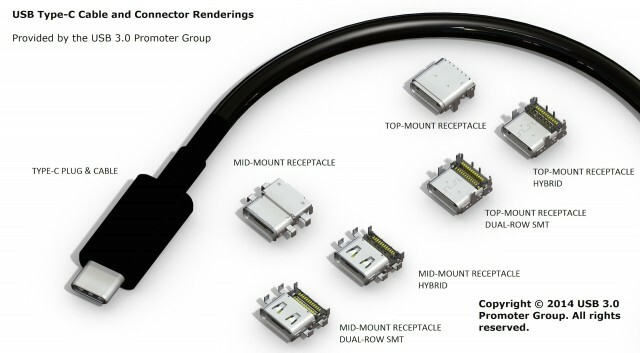 The USB Promoter Group claims the USB Type-C connector is rated as Micro-USB to 10,000 cycles. Another claim is that design is supposed to be future-proof so will be part and parcel of any USB versions in the years ahead. Note: USB Type-C can support USB Power Delivery if the device’s host controller and the cable itself support the standard, but the fact that you have USB Type-C does not mean you automatically have USB Power Delivery. The new USB Power Delivery specification had a parallel development to USB 3.1 which is also why, like the Type-C connector, USB Power Delivery is separate from the USB 3.1 specification. Together with the USB Power Delivery standard there will arrive new PD-aware cables. These will have an interesting feature called “handshake” - which will happen between a host and device. The Device itself can request up to 20V at 5A from the host, but before the host can deliver more than 5v at 900mA, it will check if the cable is able to safely deliver the requested power. Note: Ports that will support respective USB Power Delivery profiles with voltages greater than 5V, or currents greater than 1.5A, would be marked with according logo. USB Type-C supports USB 2.0, USB 3.1 Gen 1 (SuperSpeed USB 5 Gb/s), and USB 3.1 Gen 2 (SuperSpeed USB 10 Gb/s) data speeds. Note: USB 2.0 and USB 3.1 are defined under separate specifications.